An abrupt change in temperature thanks to a passing cold front turned summer quickly into fall in Greater Moncton this week. On Tuesday, Environment Canada reports a temperature of 22°C at 11am which plummeted to 16°C by 1pm and the wind direction changed from the southeast to the northwest. The long, hot summer in New Brunswick was suddenly over. The daytime high on Wednesday was 13.6°C which was the coolest day since 25 June. Forecasters are calling for near or slightly below seasonal temperatures until the end of the month (Normal high 18°C, normal low 7°C). While a snowflake or two is common in early May in New Brunswick, accumulating snow is rare in the latter part of the month. A cold front pushed through the province today and with a change in wind direction from south to north, precipitation changed from rain to snow and the thermometer plummeted. Bathurst and Miramichi both reported snow today and in some areas it began to stick to the ground while thunderstorms rolled through further south. In Greater Moncton, the temperature drop was dramatic with a high of 16 C at 11am and by 4pm it was only 5 C.
Meantime, parts of central Newfoundland are under a snowfall warning with 15 to 30 cm in the forecast. As dark and dreary as November seems in Southeast New Brunswick, temperatures can often be volatile and this month was no exception. Greater Moncton had at least five dramatic temperature swings starting on 10-11 November with a high of 10 C falling to -7 C with strong winds gusting up 69 km/h and the first snow flurries of the season. The monthly mean of 1.9 C was exactly normal with highs near 20 C on two days early in the month while two days remained below freezing. Overall precipitation was near normal for the first time since May although snowfall at 3.2 cm was well below normal. A dynamic storm system has produced a blizzard, severe storms with large hail and crazy temperature swings from North Dakota to Texas. 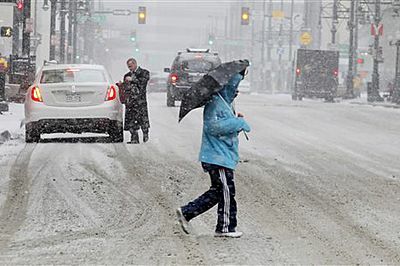 Heavy snow fell in many areas with the U.S. National Weather Service recording snowfall records being broken in 44 cities with some parts of Nebraska receiving as much as 60 cm. A dramatic drop in temperature also occurred with Abilene, Texas falling from a scorching 33 C to near freezing in less than 8 hours from last night to early today. The same storm system is moving into Ontario tomorrow and is expected to bring heavy rain and snow.